GrowZorb is made from a cross-linked synthetic polymer. No. GrowZorb is made from specialty proprietary ingredients that are safe. There are similar looking foams out there, are they the same thing as GrowZorb? Definitely not! Similar looking foams are manufactured from the same polymer family as Growzorb, however they do include nasty chemicals that just don’t support life and would be bad if they get into your food stream. No. GrowZorb is a cross-linked synthetic polymer. That means that the components it is made from all join together to form a new material that cannot be separated again, not even by industrial solvents. No. Neither moisture, time nor moderate heat will break it down. This is one of the reasons that it can be used over and over or for long periods of time. Can it be used for organics? Well, here’s a can of worms! It depends on your definition. Is your definition based on traditional growing methodology or the actual composition of the plant? For die-hard organics everything must be 100% natural, which means you can’t even grow in plastic pots. For others it’s all dependent on what the plant eats in order to grow. You can’t use any synthesized chemical fertilizers. The GrowZorb matrix is inert. It is cleaner than a natural rock (rock is comprised of minerals) It is cleaner than natural soil (which is made up of many things) It will have no effect on a plant good or bad, it is simply a structure for roots to grow around providing stability and moisture dispersion. 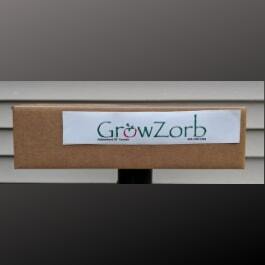 Therefore if you are using an “organic” (liquid) fertilizer then the plants grown in GrowZorb should be deemed organic. Can slabs be used for starting? Not recommended. We have found that the slab matrix is a bit too tough for the radicle to penetrate on some species. We recommend using the GrowZorb Grind. Is it itchy like Rockwool? No. 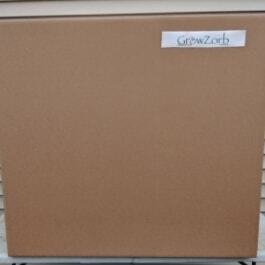 GrowZorb is soft, clean and quite pleasant to work with. The Grind material can be a bit dusty until it gets a bit of moisture on it. How to clean between cycles? 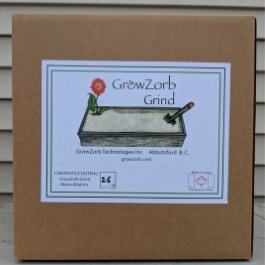 GrowZorb Grind material can sterilized by creating a slurry of water and your favorite disinfectant, it can then be rinsed and strained (standard pots typically have enough drainage to facilitate as the strainer) and immediately put back to use. Can it be mixed with other soils? It can be, but it’s not recommended as soil is heavier than the GrowZorb and will crush it minimizing its effectiveness. Keep in mind that GrowZorb is well suited for re-use, if disposal is necessary it classifies as an inert domestic waste. This means it is not harmful to a landfill. Furthermore as GrowZorb has a very low density, the volume it takes up in a landfill is substantially smaller than the “other guys” GrowZorb will crush down significantly reducing the number of trips to the disposal site. Can it be used for other applications? Yes, GrowZorb Grind products are excellent as spill cleanups in the garage/shop, if used to cleanup petroleum products follow local bylaws for disposal.